The Carolina Panthers and Jacksonville Jaguars, who had come into the NFL together in 1995, started off the 2003 season on September 7 in Charlotte. It was the head coaching debut for Jacksonville’s Jack Del Rio, who had been Carolina’s defensive coordinator the previous year. The Jaguars were coming off of three straight losing seasons under their original head coach, Tom Coughlin, after having been a playoff team the previous four years. The team was looking to the future, not only by hiring Del Rio, but in drafting QB Byron Leftwich out of Marshall in the first round, although Mark Brunell, nearing his 33rd birthday, would start the season. Sixth-year RB Fred Taylor was still a key player in the offense, although star WR Jimmy Smith, at age 34, appeared to be on the downside and would miss the first four games of the season due to a drug suspension. The defense was in transition. Carolina, in its second year under Head Coach John Fox, was on the upswing. A 1-15 team two years earlier, the Panthers were 7-9 in ’02. 37-year-old QB Rodney Peete played well in the conservative offense the previous year, but Jake Delhomme (pictured above) had joined the team after five years as a backup in New Orleans to mount a challenge. RB Stephen Davis arrived from the Redskins to strengthen the ground game and 35-year-old WR Ricky Proehl to bolster the receiving corps. The defense was young and tough, featuring ends Julius Peppers and Mike Rucker up front. There were 72,134 fans in attendance for opening day at Ericsson Stadium. Stephen Davis took a handoff on the first play from scrimmage of the game and ran for 20 yards, but it would prove to the Carolina’s only first down of the first half. The teams traded punts throughout the opening period until, early in the second quarter, Mark Brunell fumbled and DE Al Wallace recovered for the Panthers at the Jacksonville 31. However, the punchless offense was unable to capitalize on the turnover, moving backward rather than forward. Peete was sacked for a nine-yard loss on third-and-nine, and Todd Sauerbrun punted for the fifth time. The Jaguars proceeded to drive 80 yards in nine plays. Brunell completed three passes, the longest to WR J.J. Stokes for 22 yards, and the Panthers were penalized twice. FB Marc Edwards ran two yards up the middle for a touchdown to cap the series and, with Seth Marler’s extra point, Jacksonville was ahead by 7-0. The contest reverted to form until, with 29 seconds left, the Jaguars regained possession at their own 47 following a punt and 12-yard return by WR Jermaine Lewis. Brunell connected with Fred Taylor for 18 yards and, after a false start, tossed two short passes to Stokes before going long to WR Matthew Hatchette for a 33-yard touchdown on the last play of the half. Marler kicked the PAT and the visitors took a 14-0 lead into the intermission. The Jaguars added more points with their first possession of the third quarter, driving 46 yards in ten plays that concluded with a 40-yard Marler field goal and 17-0 lead. When the Panthers came out for their first series of the second half, Jake Delhomme was at quarterback in place of Rodney Peete. Clearly excited at the opportunity to play, he immediately energized the offense. Davis ran the ball three times for 24 yards and the Panthers got on the board when Delhomme threw to WR Muhsin Muhammad for a 13-yard touchdown. John Kasay’s extra point made it a ten-point game. Jacksonville had to punt following a short possession and the Panthers again drove to a score. Davis ran three times for 14 yards and caught a pass for another 11, one of two completions for Delhomme. However, after reaching the Jacksonville 20, an offensive pass interference penalty backed the Panthers up and they settled for a Kasay field goal from 49 yards. Still, they were just a touchdown behind at 17-10. It got worse for the Jaguars, who bogged down in their own territory, thanks to a penalty and a sack. Carolina RB Rod Smart blocked Chris Hanson’s punt, which resulted in a safety and two more points for the Panthers. WR Steve Smith returned the free kick 38 yards and, with Davis and RB DeShaun Foster running effectively, the Panthers again moved into Jacksonville territory. However, they came up empty this time when a Delhomme pass was intercepted by CB Rashean Mathis. The reprieve was a short one for the Jaguars as they went three-and-out and punted once again, and this time Carolina did not fail to reach the end zone, going 52 yards in seven plays. Delhomme had three more completions, with the last resulting in a 24-yard touchdown to Smith. An attempted two-point conversion failed, but the Panthers were in front by 18-17. The Jaguars weren’t ready to quit, however, and pulled off a big play in short order as Brunell threw to Lewis for a 65-yard TD. They also failed in their try for a two-point conversion, but were back in the lead at 23-18 with less than six minutes to play. Delhomme gave up another interception on the next series, this time by LB Akin Ayodele. Playing conservatively, the Jaguars punted the ball back four plays later, and Smith returned the kick 36 yards to give the Panthers good starting field position at their 46 with 3:34 remaining. Davis ran twice for nine yards and Delhomme gained a yard to convert third down. Passes to Smith and Foster picked up 19 yards and, on a third-and-two play, Davis ran around end for four yards. Reaching the 12 and facing fourth-and-11, Delhomme threw to Ricky Proehl in the left corner of the end zone (pictured at right), who made the catch for the touchdown with a scant 16 seconds left to play. Yet another two-point conversion attempt failed, but Carolina was back in front by a point. In the time remaining, Brunell passed the Jaguars down the field, but a 55-yard field goal try by Marler was blocked by safety Mike Minter and the Carolina celebration began. In dramatic fashion, the Panthers had won by a score of 24-23. Jacksonville had the edge in total yards (331 to 242) although both teams generated 17 first downs. The Panthers turned the ball over twice, to one suffered by the Jaguars, and Jacksonville had the edge in sacks (five to four), although three of those sacks were of Peete during the first half. There were 17 penalties, divided almost evenly, with Carolina drawing nine and the Jaguars eight. Jake Delhomme completed 12 of 20 passes for 122 yards and three touchdowns, giving up two interceptions. By comparison, Rodney Peete had been four of ten for 19 yards. Stephen Davis rushed for 111 yards on 22 carries. Steve Smith topped the Carolina receivers with four catches for 44 yards and a TD. For the Jaguars, Mark Brunell (pictured at left) completed 13 straight passes at one point to tie the franchise record and ended up being successful on 23 of 27 throws for 272 yards and two TDs, with none intercepted. J.J. Stokes had the most catches, with 6 for 42 yards, while Jermaine Lewis gained 90 yards on three receptions, thanks to the long touchdown. Matthew Hatchette contributed 60 yards and a TD on his four catches and, in addition to rushing for 71 yards on 22 attempts, Fred Taylor also had 5 catches for 51 yards. The decision was to make Jake Delhomme the starting quarterback, and the Panthers started off the season with five straight wins on the way to an 11-5 finish, NFC South title, and playoff run that made it to the Super Bowl, where they lost to the Patriots. Jacksonville, on the other hand, lost its first four games in going 5-11 and placed fourth in the AFC South. 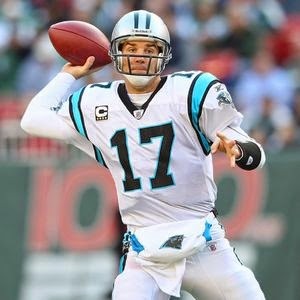 Delhomme, in his first year as a starting quarterback, threw for 3219 yards and 19 touchdowns. He would remain with the Panthers for another six years. Stephen Davis ran for 1444 yards on 318 carries (4.5 avg.) and eight TDs and was selected to the Pro Bowl. 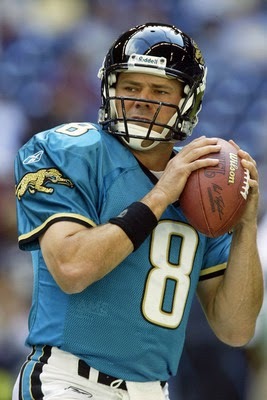 In what was his last of nine seasons in Jacksonville, Mark Brunell yielded the starting job at quarterback to the rookie Leftwich after three games. He ended up throwing just 82 passes for 484 yards and his two TD passes against the Panthers were his only ones of the year. Overall in Jacksonville, he passed for 25,698 yards and 144 touchdowns and was named to the Pro Bowl three times.